It is very important to mow your lawn weekly and at the correct height. Mowing at the correct height increases the lawns density and also keeps the root system healthy. A healthy root system means the nutrients and water will be absorbed rather than wasted. Mowing at the correct height will also help keep weeds out. 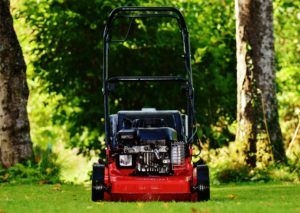 Mowing should be done often enough so that no more than one-third of the leaf blade is removed at one time. For example if St. Augustine grass is cut at 3 inches it should be mowed at 4 to 4.5 inches. The frequency of mowing depends on the type of grass you have. Bahiagrass should be mowed 7-17 days, Bermudagrass should be mowed 3-5 days, St. Augustinegrass should be mowed 5-14 days, and Zoysiagrass should be mowed 10-14 days. Research shows that returning the grass clippings to the lawn is beneficial. The clippings have nutrient value and decompose quickly returning some of the fertilizer and organic matter back to the soil.